Let’s be honest, you didn’t start learning the ukulele to play “Mary Had a Little Lamb” or “She’ll Be Comin’ Round the Mountain.” But too often that’s what you’re stuck doing as a beginning ukulele player. It’s boring, and it’s a little bit discouraging. Here at Acoustic Bridge, we believe that learning instruments should be fun, and none more so than the ukulele. After all, the ukulele is one of the easiest instruments to learn. And some of the coolest songs out there are also easy songs to play on the ukulele, even if you’re a complete beginner. With just a few simple chords and basic strumming patterns, you can be playing popular tunes and fun songs on the ukulele in no time. In fact, you can play many awesome ukulele songs with only four easy chords. Don’t Have a Ukulele Yet? They look easy, right? 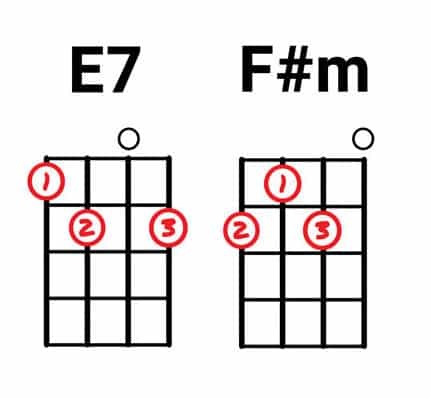 C and A minor only use one finger, F uses just two fingers, and the G chord is a simple shape that many uke players find easy to make. 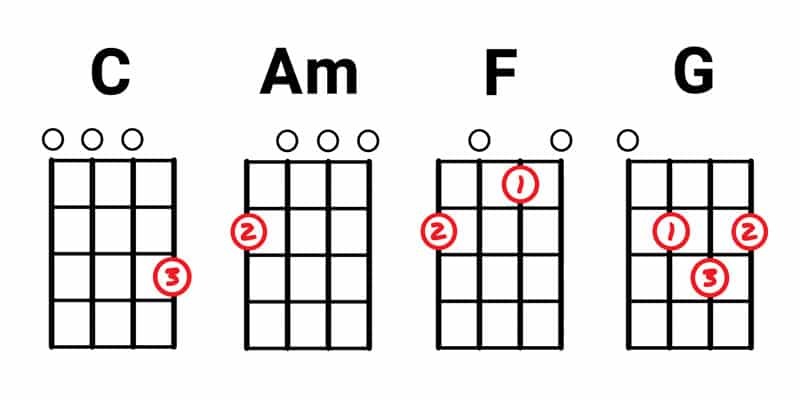 If you’re a guitar player, you may notice that it’s the same shape as the D chord on your guitar. With these easy chords, you can play a long list of 2, 3, and 4 chord ukulele songs. And we’re talking about popular, well known songs that you’ll actually want to play. Many of the video tutorials for these songs below include tips on strumming patterns. But you can make your ukulele strumming as simple or as complex as you’re able to. If you’re just starting out, try simply strumming one downstroke for each downbeat (when you tap out the rhythm of the song with your foot, a downbeat is when your foot hits the ground). ​That should be enough to get you started playing these songs, but check out this great guide over at Ukulele Hunt for more strumming patterns and advice on strumming the ukulele. These popular songs for ukulele use only the C, Am, F, and G chords. We’ve included a video tutorial and links to the easy ukulele tab for each song to help you get started playing them today. Click here for the full chords. 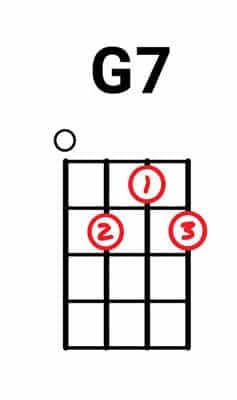 7th chords add a jazzy feel to any tune. But, you can always play a normal G chord instead. These next songs are also easy to play, but they throw a few new chords into the mix. Learn these chords, and you’ll be able to play some of the best songs to play on the ukulele. 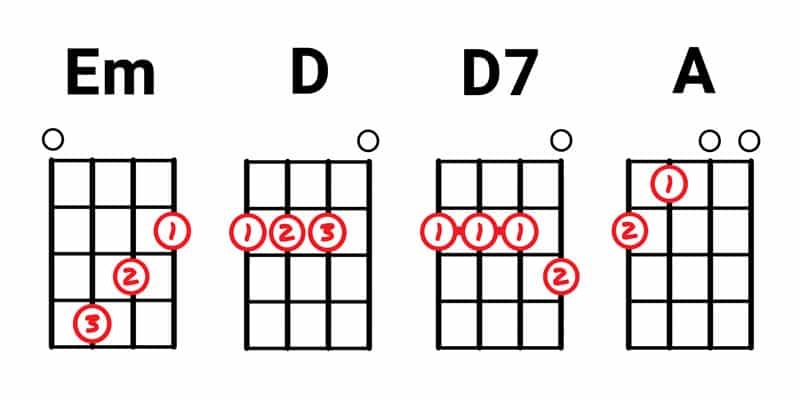 The D7 chord uses a barre, which means that you lay your first finger straight across the strings. 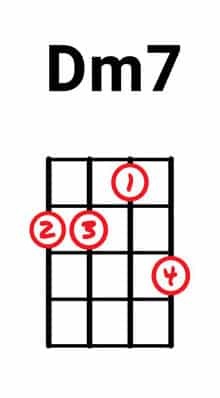 This might take a little practice, so if you’re having trouble playing it you can always play a regular D chord instead. And now for the songs! C﻿﻿lick here for the full chords. These last two songs are a little more complicated to play, but they’re also some of the most fun songs to play on the ukulele. Most tutorials will tell you to play Wagon Wheel using G, D, Em, and C like you would on a guitar. And that’s perfectly fine to do, but it’s actually much easier to play on the ukulele using the chords A, E7, F# minor, and D.
However you decide to play it, Wagon Wheel is a great song that’s a lot of fun to play! This is one of the most famous songs for ukulele out there, and it’s the song that starts a lot of people out on their ukulele journey. This is a great song to tie everything together and reinforce all the new chords you’ve learned. And get ready to have a blast playing all the easy ukulele songs on this list! It is a great and warm effort to help learners. Thanks a lot . great information! house of gold by twenty one pilots is a good one as well. Thanks, my uke class of 6th graders will be thankful they can play more than hot cross buns and the farmer in the dell. Your article has a really good information and awesome tips. Please keep up the good work. Your information helps me a lot to increase my guitar skills. Photos are well arranged. Great list to learn. Thanks!